Cal Ripken, Jr. was born on Wednesday, August 24, 1960, in Havre De Grace, Maryland. Ripken, Jr. was 20 years old when he broke into the big leagues on August 10, 1981, with the Baltimore Orioles. His biographical data, year-by-year hitting stats, fielding stats, pitching stats (where applicable), career totals, uniform numbers, salary data and miscellaneous items-of-interest are presented by Baseball Almanac on this comprehensive , Jr. baseball stats page. Calvin Edwin Ripken, Jr. was a Major League Baseball player who spent his entire 21-year career playing shortstop (2,302 games) and third base (675 games) for the Baltimore Orioles The Iron Man , for playing in 2,632 consecutive games , breaking the "unbreakable" record set 56 years earlier by Lou Gehrig . 1. On May 6, 1984 , Cal Ripken, Jr. hit a triple in the third inning, a single in the fifth, a double in the seventh, and homered in the ninth - becoming the first Orioles shortstop (including their time as the St. Louis Browns , 1902-1953) to hit for the cycle . 2. On October 16, 1983 , Cal Ripken, Jr. took the field during Game 5 of the 1983 World Series , a 5-0 victory over the Philadelphia Phillies , winning the world championship. Ripken started all five games during that Fall Classic , and earlier that year, the Iron Man had played in all four games of the American League Championship Series, the 1983 All-Star Game , and all 162 regular season games - the first player in Major League history to appear in every regular season, League Championship , and World Series game ! 3. On September 14, 1987 , Cal Ripken, Jr. was replaced in the field in the top of the 8th inning by Ron Washington . The Iron Man had played in every inning of every game since June 5, 1982 - 8,264 consecutive innings, crushing the previous record of 5,152 consecutive innings played set previously by George Pinkney ! 4. On September 24, 1990 , Cal Ripken, Jr. committed an error, his third - and last - of the season ( April 13 & July 28 ), setting a new single-season record for fewest errors by a shortstop (minimum 150 games played) in baseball history. That mark remains unbroken through today! 5. 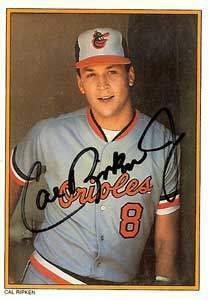 On July 15, 1993 , Cal Ripken, Jr. hit a home run off Scott Erickson , in the sixth inning, at Oriole Park at Camden Yards. It was The Iron Man's 278th home run as a shortstop, passing Hall of Famer Ernie Banks ' record for Home Runs in a Career while playing short. 7. On September 6, 1995 , Cal Ripken, Jr. said, "It was like an out-of-body experience. It's like when your wife is having a baby. You're watching and thinking, 'This can't be me. This can't be my wife. This can't be my child.' You think it's happening to someone else. These last two nights here, I kept thinking, 'This can't be happening to me. This has to be someone else." It was not somebody else, it was The Iron Man, and on that truly spectacular evening, Ripken played in his 2,131st consecutive game , breaking the record of 2,130 straight games, set previously by Lou Gehrig . 8. On October 6, 2001 , Cal Ripken, Jr. took the field one last time, the day after he played in both games of a doubleheader ( Game 1 | Game 2 ), and ended his career in front of 48,807 fans in Camden Yards. It was the last day a Baltimore Orioles player ever wore #8 during a baseball game. The National Baseball Hall of Fame called Cal Ripken, Jr. on January 9, 2007, saying, "Welcome to the Hall of Fame!" They continued to share specific details, he was named on 537 of the 545 ballots submitted, it was the largest number of votes ever received, and his name appeared on 98.53% of the ballots, the third highest percentage (at that time). Ripken joked, "Really, all I wanted to hear was, 'You're in!'" Do you know who was first ( Answer ) or second ( Answer )?